When I wake up in the morning, the first question that needs to be answered is sweet or savory? Once I cross that one off my list, I can get on with breakfast and then, the rest of my day. Today was most definitely a sweet day. Luckily I had just the recipe in mind. When my recent issue of Everyday Food arrived, I began flipping through the pages and was immediately drawn to the buttermilk waffles and their ideas for toppings. I had never used walnuts on my waffles before and was excited to try it. This morning presented the perfect opportunity to try out the recipe. Here it is for you, in all its deliciousness. Sometimes the simplest and most classic of breakfasts are the best, don't you think? Heat waffle iron. Combine dry ingredients in a medium bowl and set aside. Whisk buttermilk, eggs and butter together until combined. Fold the dry ingredients into the wet using a spatula until just combined, being sure not to over-mix. The batter will be lumpy. When the waffle iron is hot, spray lightly with canola oil and add the batter (each waffle iron takes a different amount of batter). Cook until golden, top with the walnut syrup and enjoy! Stir the ingredients in a small saucepan over low heat until warmed through. OMG, those look so yummy. 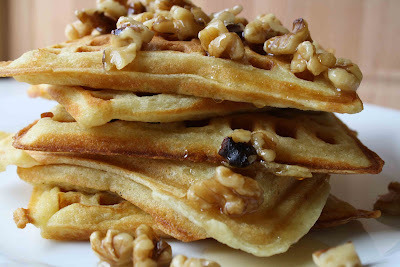 mmm walnuts on waffles, what a delicious alternative to the old pecan waffle standby. I will be trying these out soon! I gave you a blog award. Go check it out on my food blog. Looks so yummy!! The photo itself just sums up a perfect breakfast! I am almost temoted to lick my monitor those waffles look so darn good!